Holotype: USNM 579179, adult ♀, skin and skull. Type locality: “Panamá, Bocas del Toro: Isla Escudo de Veraguas, West Point”. Anderson, R.P. & Handley, C.O. 2001. A new species of three-toed sloth (Mammalia: Xenarthra) from Panama, with a review of the genus Bradypus. Proceedings of the Biological Society of Washington 114(1): 1–33. BHL Reference page. 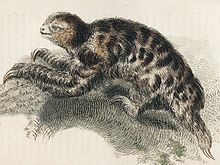 Bradypus pygmaeus in Mammal Species of the World.